Periodic packaging and transmission of reports, spreadsheets, etc. WinZip jobs let you specify what files you want zipped, how you want them zipped, where the resulting Zip files should go, and more. Please see the various sections of this article below for more. The easy-to-use Job Wizard helps you to create and/or edit your own jobs. It guides you, in a few quick steps, through the process of specifying exactly how your backup job should work. Scheduling jobs is easy with the WinZip Job Wizard. Just choose daily, weekly, or monthly; specify schedule details if applicable; type in your user name and password; and click OK. 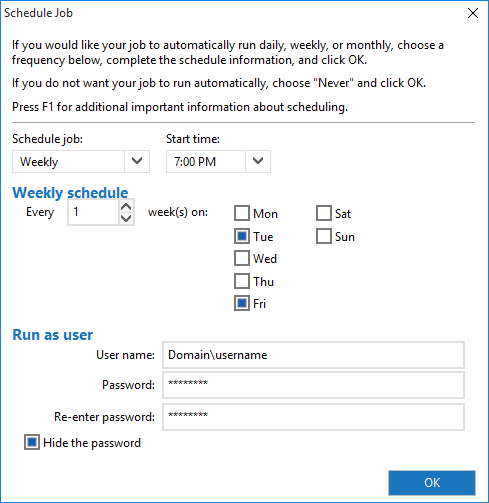 Since the Schedule Job dialog is a custom interface to the Windows Task Scheduler, your username and password will be required to save your scheduled job. Note: The WinZip Job Wizard will prefill User name in a fashion similar to Computer name\user name. If the computer is a member of a domain, you will need to change the user name to be similar to Domain\user name. If you need to backup your data to a cloud service or to an FTP server, click the Save to button in step 6 of the Job Wizard. If you click Cloud on the drop down menu, the Configure Saving to Cloud dialog will open. You can then check the box to Save the Zip file to a cloud service and click the button to select which service to use. If you are not currently logged in to the cloud service you select, you will be prompted to do so. 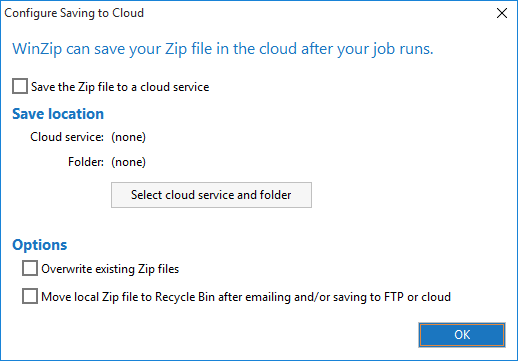 You can also choose options to overwrite an existing Zip file, if one is in the chosen location, and/or to move the Zip file created on your local drive into the Recycle Bin after a copy of it has been uploaded. If you choose FTP when using Save to, the Configure FTP Connection dialog will open. You will need to choose to Upload the Zip file to an FTP server, fill in a few fields to tell WinZip where to send the file (you can even browse to find the correct folder), and then you're done. 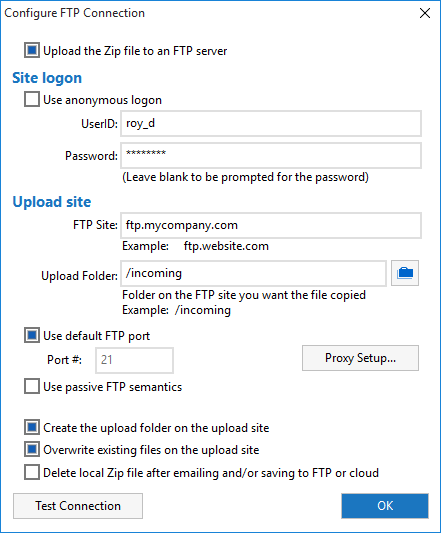 Whenever your job runs, the resulting Zip file will be automatically uploaded to the folder you specified on your FTP site. Starting with WinZip 18.5, FTP is provided with your other cloud services. From an open Zip file, you can click File Save As and choose FTP from the listed cloud services if you wish. This is also an option you can choose while creating and saving a Zip file. You can send the Zip files created by WinZip Backup jobs to an email recipient as files or as a cloud link. You can also configure your backup job to send you a notification when it has finished. 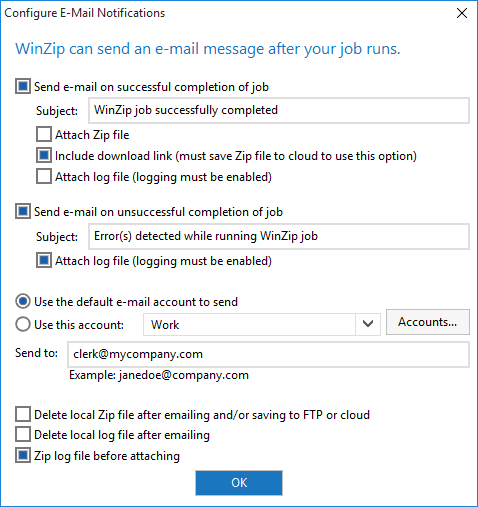 To do this, click Email in step 6 of the Job Wizard, select your desired notifications, specify the email account information, choose from the list of options, and WinZip does the rest. Whenever your job runs, the Job Wizard will email the resulting Zip and/or log file automatically. If you click the Email button in Job Wizard before you have configured an email account (in WinZip), the Set Up EMail Account dialog will display first. 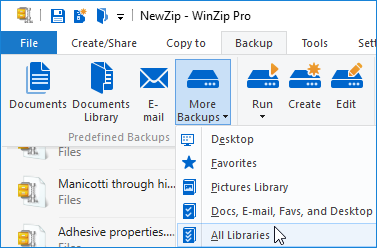 The Email tab in the WinZip Options dialog can be used at any time to add an email account or make changes to ones you have previously configured.